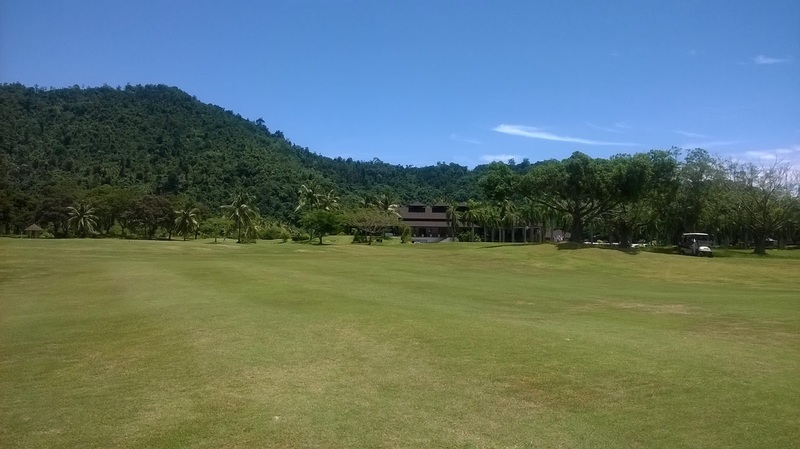 TRAVEL AND LEISURE IN BORNEO: Karambunai Golf Resort: Some say here lies Heaven! Karambunai Golf Resort: Some say here lies Heaven! "Some Say Here Lies Heaven!" says the billboard when you enter Karambunai Resort. I don't doubt a bit. The Karambunai Golf Resort is sandwiched by the beautiful white beach of the South China Sea in the west and on the east are the hills that is covered with thick primary tropical jungle. 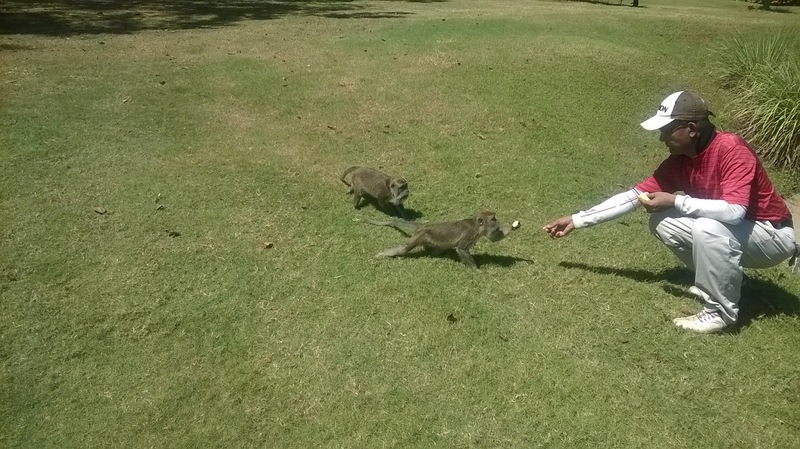 Golfers or tourists can watch the macaque monkeys foraging foods as well as playing and chasing each other. Sometime the braver ones will come and beg for food from the golfers. At this moment, these monkeys doesn't look aggressive probably because it is the smaller species found here at Karambunai. However, I am sad that the Karambunai Golf management try their very best to "banish" these creatures from here. They told me the monkeys are nuisance. Once an i-phone tablet was "stolen" from the buggy as tourist golfer was putting and taken deep into the jungle! It was never found. But I still believe this animal and the golfers still can co-exist. All the management has to do is to advise players to keep their valuables properly. This monkey does make the course unique. Karambunai is also home to the monitor lizard or "dragons" as the American call it. It is a common sight to see these dragons battling each other for the limited spaces. When these dragons fight, they stood up and cuddled each other! A person not familiar with this reptile tend to think this creature are courting! 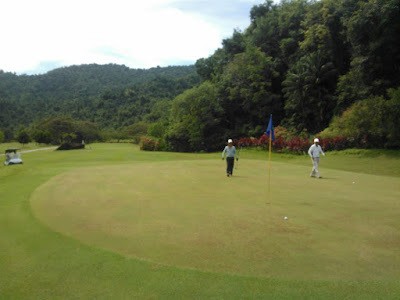 (See my Facebook Page TRAVEL LEISURE AND GOLF IN BORNEO. I have included two videos of these dragons). Karambunai Golf Resort was design by Ronald Fream. It is an 18 hole course Par 72. For a high handicappers, Karambunai is a very difficult course because of the numerous ponds, bunkers and the hazard at the jungle boundaries. A beginners will find this course nightmarish because they have to lose dozens of balls before they could finish the course. But for the single or the pro, this course is a piece of cake. The fairways are wide, and the greens are not that long. Good players usually reach the Par 5 in two. So no problem about birdies!